Ricky and I took Ethan to King's Island last Sunday for a special day with just mommy and daddy (we try to do this often since we spend a lot of time caring for and out of town with Aiden). He was so good and truly loved every minute of it. We got there early enough that we rode about half of the rides in Kiddie Land without waiting in a single line. That's the way to do it let me tell you! 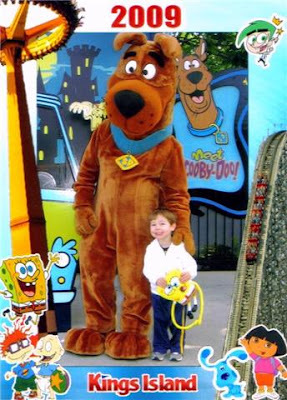 Anyway - here is a cute one of E with Scooby. We ended up shelling out an exorbitant amount of money for it (I will never forget our camera again)! But we couldn't pass it up. PS - lots more updates on Aiden, including pictures, coming soon!